Wow, is it nice to be back! I seriously missed blogging when I was insanely busy doing college applications, schoolwork, signing up for (one too many) extracurricular, and other high school stuff. While it’s all far from over, yesterday, I was able to record my tapes for pre-screening (the step before auditions), so now I can finally submit all of my applications and have that part of the process done with! One of the crazier things that I’m doing this year is playing in 5 separate chamber ensembles. If you’re a musician, you can realize how much I actually signed myself up for, but even if you aren’t, that means that I’m rehearsing 7 hours a week without counting any orchestra or solo practice. What’s fun about it is that they are all different groups (as in the structure of the group), so it’s not like I’m playing 5 pieces all within the same category. For example, I’m in a flute quartet at MSM, which is the first time I’ve played chamber with a flute player. Not to mention, all of the music I’m playing is just spectacular, which can never get boring. But that’s enough about me. It’s time to get to the real deal stuff- this pumpkin butter. I love fall baking (although by the amount I’ve been posting recently you can’t tell), but I didn’t want to have to worry about the mess that I tend to create when I bake. And, since the rule in my house is I have to clean up everything after I bake, I wanted to make something that would be delicious but at the same time save a lot of clean up time. 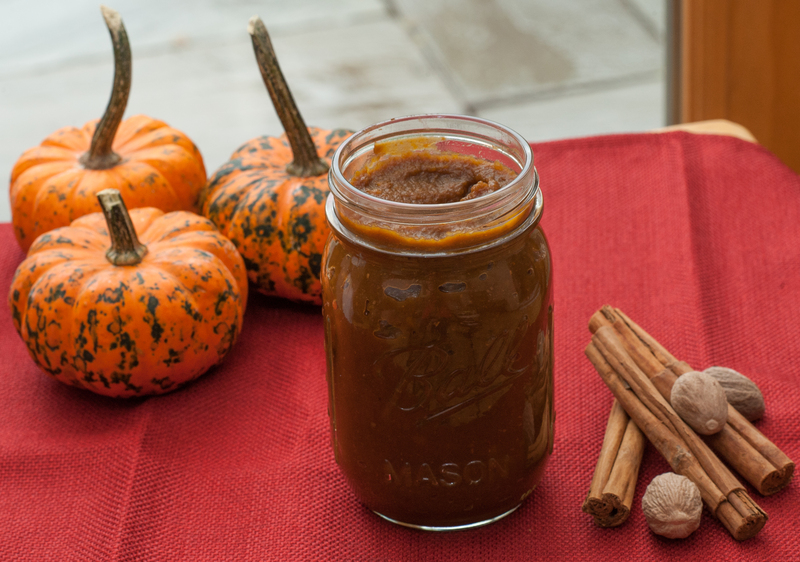 So, I found this pumpkin butter over on Smitten Kitchen that I knew would fit the bill exactly. It’s a nice blend of spices that create the warm, fuzzy feeling that we all love about pumpkin baking, but I wanted to have more than just pumpkin puree heated up with some spices, so I added coconut milk and pomegranate juice. The pomegranate gives it enough of a bite that you get flavor as soon as you taste it, but the coconut milk makes it creamy, so as not to make the entire thing too acid. Really, you can add whatever flavors you want, but I like this variation. Combine pumpkin, pomegranate juice, coconut milk, spices, and sugar in a large saucepan; stir well. Bring mixture to a boil. Reduce heat, and simmer for 30 minutes or until thickened. Stir frequently. Adjust spices to taste. Stir in lemon juice, or more to taste. Once cool, pumpkin butter can be kept in an airtight container in the fridge. Sometimes a simple homemade butter can brighten up your early school mornings. More recipes coming soon!